The 40 greatest family games, from Guess Who to Catan. Codenames! Catan! Sorry! Transform screen time into game time with these immortal classics. 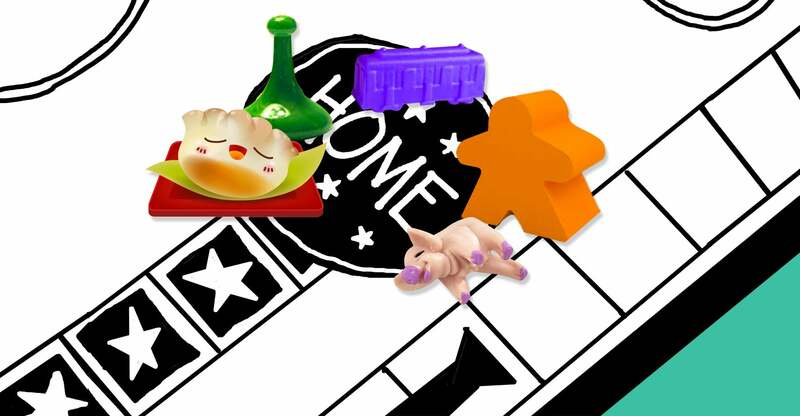 For some families, game nights are at the very core of who they are and how they live together. From generation to generation, brothers and sisters and cousins in game families have shared in-jokes, swapped anecdotes, and passed down the legend of that time Grandma accidentally drew something kind of racy in Pictionary. When they gather around a game board, they’re at their smartest and their funniest, and they make some memories. And then there are those families whose kids melted down during one game of Monopoly, and they never pulled a board game out of the cabinet again. No matter where you are on this continuum, Slate’s list of the 40 best family games is for you. The past two decades have seen a renaissance in family-friendly tabletop gaming, with new games taking the best elements of the classics, then reimagining and improving them. Some of the more popular modern games have become franchises, spawning expansion packs, special variant editions, and mobile apps. There’s no reason why any parent these days should wish for a fun family gathering and then come back from the store with Scrabble, Battleship, or Clue. There are so many better options out there: games that are more fair, more exciting, and more likely to provoke memorable conversations afterward about the choices everyone made. Games should be the right length. Long enough to allow players to develop strategy and potentially to come back from early setbacks, but not so long that everyone gets sick of them before they’re over. Games should be fair. If you sit in a specific seat, or go last, you shouldn’t be disadvantaged. Games should be action-packed. It’s more fun when there’s something for players to do on every turn, or even on other players’ turns; it’s frustrating to be skipped because you lack the resources to make any significant moves. Games should help you learn something. “Educational” games are often boring, but some of the most entertaining games offer either implicit or explicit lessons about reasoning, sportsmanship, math, ethics, and teamwork. Games should encourage spontaneity. Games that favor creativity and conversation make each experience more personally rewarding to all of you than games that are played the same way every time. After all, you’re not playing with just anyone. You’re playing with your family, so it’s more fun to play a game that lets each of you shine. We’ve arranged our 40 games by the ideal age for a kid to play them, from 4 to 16. (Of course, that’s merely a recommendation. Plenty of little kids enjoy games that you might think are too advanced for them, and plenty of big kids enjoy something simple now and then.) We’ve also noted what style of play each game is, the optimal playing conditions, and whether each game might even be fun—perhaps after a glass of wine?—for adults to play together after the tots have gone to bed. And we’re also celebrating the fun of family games by publishing Slate writers’ odes to the games they love the most—and their defenses of the truly bad ones. So buy a game or two, borrow one from a friend, or see if your local library has games to lend out. And then pop some popcorn, light a fire in the fireplace, and gather ’round the table. It’s never too late to get a game night tradition started. Roll to see who goes first! “At least it’s not Candy Land”: Read Dan Kois’ ode to Guess Who? Using plastic swine as dice makes Pass the Pigs kooky and adorable for both young and old. Points depend on variables like whether the little porker’s nose is touching the table (a snouter!) or its legs are in the air (a razorback!). This is also a good game for teaching the concept of risk. Players keep rolling until they choose to stop or until they wipe out, racking up points so long as they avoid any of the killer combinations. On any given turn—even the last one of the game—a player can surge into the lead, or lose everything. The most enduring Western variation on the centuries-old Indian game of Pachisi, Sorry! is at once one of the easiest games for kids to learn and one of the most frustrating to play—though its frustrations are character-building. Yes, you’re trying to move your pieces—your “mice,” in traditional game parlance—around the board toward “home,” but the game’s peak occurs when you have the chance to sabotage the competition, sending one of your opponents’ pieces back to the start. Sooorrrrry!! The game offers opportunities for families to have some deep discussions about patience, about not being a sore loser … and about the virtues of showing mercy. The late Richard Scarry’s picture books have been popular for generations, not because they tell great stories (they’re mostly plotless), but because his minutely detailed drawings of anthropomorphic animals are so pleasing to the eye and nourishing to the imagination. During this Busytown game, players regularly stop their pieces’ forward motion to scurry around the long, narrow board, scrutinizing hundreds of illustrations to find a handful of items scattered about. Best of all: The game is cooperative, not competitive—everyone has to make it to the finish line together—which makes this the game least likely to provoke arguments among tots still learning sportsmanship. The name “Concentration” is a catch-all for a variety of matching games—some officially branded as Concentration, some not—wherein players flip over face-down cards in pairs, looking for two alike. It’s a versatile enough concept that it can be played with a standard deck for free, or with specially designed cards that add twists. (For those lucky enough to have Milton Bradley’s home version of the TV game show Concentration, there’s an added bit of fun: As the pairs come off the board, they reveal a rebus puzzle, which must be solved for the big win.) The game can be played alone or in groups, but in every iteration there’s an orderly quality that’s almost meditative. Bit by bit, cards find their mates and get stacked into neat little piles. As in Tic-Tac-Toe or Connect Four, the object of Sequence is to string together markers into a straight line—in this case, five colored chips, arranged across a board. The difference is that players’ choices in Sequence are limited by the cards in their hands, which correspond with squares on the playing area. This is an easy game for kids to grasp (especially the variation Sequence for Kids), because in each turn there are only so many plays to make and because their cards are determined by random draw. It’s also a fun game for parents to play with their children, with just enough strategy and just enough chance that adults will be neither bored nor dominant. A standard deck of playing cards is all you need for a round of the classic card-shedding game Crazy Eights. The genius of Uno is that it enhances Crazy Eights with special game-changing cards like “Skip” and “Draw 2,” adding elements of unpredictability and opportunities to play defense. Invented in the 1970s by an Ohio barber, Uno pioneered a whole subgenre of branded games that tweak the rules of pre-existing playing-card favorites like Spades or Rummy. While Uno’s name and mechanics (a gaming term for the design of the game’s rules and user experience) have been extended to dozens of other products (Uno Attack! Uno Slam! Duo! ), it’s still best played in its original form, with a small group of people and a ton of idiosyncratic house rules. “Bloodthirsty, thrilling, and desperate”: Read Nitish Pahwa’s ode to Uno. One common gaming objective is to claim as much territory as possible, on a fixed board, an open table, or even a piece of paper. Dots and Boxes—which has been around for more than 200 years—provides a simple, elegant way for anyone with a pencil and notepad to play a variation on the territory game, and to make it as simple or challenging as the competitors choose. Players fill a page with a square grid of dots (at minimum, nine, with no maximum), then take turns drawing short lines between the points, angling to close off one or more of those lines into squares, immediately seizing that space. Call it the thinking person’s Tic-Tac-Toe. Yahtzee’s a perfectly fine game, but it’s usually obvious after about five turns who’s going to lose, making completing the rest of the round something of a chore. In recent years, game designers have been working to maximize the most fun element of Yahtzee—rolling a handful of dice successively and putting aside the good ones—while eliminating the dreary disappointment of only partially filling in a scoresheet. In the fast-paced, tricky Las Vegas, players finish their rolls, then decide which dice to place in one of six casinos, with the hope that at the end of the round they’ll have the biggest “bet” on that property, and win the money it pays out. The dollar amounts are randomized, and because ties cancel each other out, sometimes the second-highest better wins—all of which allows Las Vegas to combine shrewd decision-making and fiendish luck. Qwirkle is among the most attractively designed of a subset of games that rely on the basic tile-laying and points-scoring mechanics of Scrabble, but which eliminate the need to have any kind of advanced vocabulary. Like Iota, Latice, and many others, Qwirkle replaces letters with multicolored shapes, which players put on the table in sets, maximizing their score if they can combine what they lay down with sets already played. The rules are easy to grasp, but ace players will see combinations others miss—which is why if you have a family of smarties, you may want to play this game with a timer, so each turn doesn’t devolve into five-plus minutes of intense staring and chin stroking. Yes, the name “Mexican Train” is questionable, especially given that it refers to a rogue spur where players slough off their misfit tiles. Nevertheless, this is the easiest-to-learn and most enjoyable of the classic domino games—which is why so many domino sets are sold with the name “Mexican Train” embossed right on the front of the box. The game requires both long-term planning and the ability to come up with alternatives on the fly, as players spot patterns in their piles of bones and methodically match number to number, trying to keep building their “trains” before an opponent or a numerical gap forces a change in course. There’s a lot to love about Spot It!, a card game that’s inexpensive and portable, with rules variations that extend the basic mechanics in fun ways. The immediate aim is always the same. Each of the 55 cards displays an array of eight images (a snowman! A clock! A ladybug! ), and between any two cards, there is always one—and, somehow, only one—matching symbol. Players have to find that match and shout it out first. Whether you’re playing a card-collecting version of Spot It!, a card-shedding version, or something else entirely, the race to be the first person to see a connection is always a nail-biter. Countless board games ask players to move their pieces, square by square, from Point A to Point B, usually at the prompting of dice, spinners, or cards. In Labyrinth, competitors can move as little or as much as they like along the corridors of a maze, heading toward objects they’re tasked to collect. The trick is that the maze is always changing—and the strategy along with it. Labyrinth looks like a cute game for little kids, but figuring out exactly the right way to manipulate the maze itself could bedevil even a Ph.D. The venerable code-breaking game Mastermind is like a more refined version of Battleship, as one player tries to narrow down the order of four colored pegs hidden by her opponent. A preset number of turns adds tension, limiting how methodical the guesser can be. The fun of Mastermind comes in watching as an idle proposition (“I dunno … yellow, purple, red, blue?”) gradually shifts into an actual, logical deduction. Kids have been playing variations of the card game Rummy with their parents and grandparents for generations, but Rummikub supercharges the game by turning the cards into dominolike tiles, and letting players disassemble and steal from their opponents’ “melds.” The result is a complex, challenging game in which a player can sit frustrated for a half-dozen or more turns, unable to make a move, until the right tile comes along, and suddenly he’s able to go nuts and lay down an entire rack at once. “Pretending you have a grand plan when actually you’re screwed”: Read Allison Benedikt’s ode to Rummikub. Not enough people know about the excellent German card game 6 Nimmt!, released in the U.S. a decade or so ago as Take 6! (though that version’s long out of print). As in Hearts and Spades and many other card games, players try to avoid getting stuck with a lot of points—which happens if they play the wrong number at the wrong time and end up having to pick up one of the rows of cards already on the table. The gameplay combines guesswork, chance, and some shrewd strategy. Sometimes, the best option for players is to take a lower-value row intentionally, to avoid a stiffer penalty. Choosing when to make that sacrifice can be the difference in the score—and is what makes 6 Nimmt! a useful exercise in pragmatism for young and old alike. Whether you’ve dropped some serious bucks on a full-size table for your game room, or you’re economizing with one of those tiny tabletop versions, whenever tiny jets of air make a plastic puck float and slide, it’s like a little miracle of science. Also, there’s something about air hockey that gets the competitive juices flowing. Swat the puck hard off the boards and into the goal, just past your sister or cousin or uncle’s flailing paddle, then throw in a little trash talk as you announce the new score. It’s the rare sports-related pastime at which the nonsporty can excel. Who’s got next? Camel Up offers yet another clever twist on “moving the mice” around a board. In this game, players don’t zip to the finish line as one of five different colored camels. Instead, they place bets throughout the race on which piece might come in first and which’ll bring up the rear. The “Supercup” expansion enhances Camel Up’s unpredictability, giving players more choices on any given turn between wagering, rolling the dice to move pieces further along, or making smaller proposition bets. Much of the fun of the game comes from talking through all the different potential scenarios—“camel-stacks” inclusive—and figuring out the most likely outcome. Square by square, players map out an entire shared kingdom in Carcassonne and populate it with their own human-shaped “meeples,” who earn points for their masters based on the cities, roads, and fields they complete. Because the builders only have access to one tile at a time, planning ahead in this game in minimal. Instead, the trick is to properly deploy a limited pool of human resources onto the land. One of the first and most popular of the modern wave of tile-laying tabletop games (a genre that also includes Alhambra, Kingdomino, Small World, and Kingdom Builder), Carcassonne has spawned more than a dozen expansions, which can be played together, potentially extending the game by hours. Experienced players prefer the first two: Inns & Cathedrals and Traders & Builders. Be warned, though: Adding any more than two expansions at a time makes the play more confusing, and kind of exhausting. Sometimes known (and sold) as “Werewolf” (or some other name that puts a frame around the concept), Mafia is at once an engaging party game and a fascinating social experiment. In one phase, the players assigned to be the villains silently agree to kill one of the heroes. In the following phase, the survivors—good and bad alike—deliberate, choosing someone from the pool of the living to pay for the crime. The fun comes from playing pretend and working with a group to solve problems. But Mafia also promotes paranoia, asking people to consider the possibility that someone they think they know well is a dirty liar—or that they themselves are capable of condemning an innocent. Like Uno, Phase 10 adds some new rules and gimmicks to a pre-existing card game: Contract Rummy, in this case. In each round, players must lay down the right number of runs or sets to move on to the next “phase.” Because the challenges get harder over time, some players can fail for multiple rounds—getting increasingly irritated—and then make a sudden surge. Also like Uno, Phase 10 has generated a number of variant editions, some involving dice or a board. The best version is the “Master’s Edition,” which gives players control of the order in which they complete the phases and also allows them to “bank” cards to use in later in rounds. One of the more popular recent game mechanics has players passing a hand of cards after picking one to lay down for themselves—with the understanding that they may never see the best cards in that hand again. Sushi Go Party! (a revised, expanded, and improved version of the game Sushi Go!) is this premise at its most sublimely cruel. Because some items that roll by on the sushi “treadmill” only score points in combination with other cards, players have to make hard choices, hoping that the gyoza or tempura they need will come back around. A fast pace and “damned if you do, damned if you don’t” set of options make this game addicting. “Sleepy wasabi”: Read Dawnthea Price’s ode to Sushi Go Party! The best argument-starting, subjectively judged game this side of Cards Against Humanity (which, more often than not, is decidedly not family-friendly), Apples to Apples asks players to decide which of a set of proposed nouns best fits that round’s designated adjective. Is Andy Warhol more dangerous than a sword? Are babies more fragrant than roses? Like the best party games, this one quickly conforms to whatever crowd’s playing it, so it can be as rigorous or as silly as the family holding the cards. “The game that makes you work for your fun”: Read Heather Schwedel’s ode to Apples to Apples. Why Boggle and not Scrabble? Because it’s more democratic, dagnabbit. (Note: “Dagnabbit” is not a legal Boggle word.) In Boggle, everyone uses the same letters, in the same configuration, and since scoring is based on both length and originality, one long fancy word isn’t necessarily any better than a bunch of three-letter words that no other player wrote down. The timer adds excitement too, eliminating the tedious deliberation that can sap the fun out of some family games and replacing it with panicked glances back and forth between the tray of letters and the rapidly slipping sand. One of the most basic forms of a party game has competitors trying hard to get a group of teammates to guess a name or a title, based on gestures and/or a limited set of clues. In Celebrity, families and friends put their own set of names into a pot and then have to figure out the best way to describe the person in question, without saying the person’s name. In later rounds, the same set of names are reused, but the clue-giver is restricted to a single word, or no words at all. The game costs nothing, and is infinitely adaptable to whoever’s gathered together—play with your English professor friends and guess Romantic poets, or play with tweens and learn all about YouTube stars and their least-favorite teachers. “You may already be exhausted”: Read Rebecca Onion’s ode to Celebrity. Though it’s only three years old, Codenames is already a new tabletop classic, with multiple variations and branded spinoffs. A smart combination of a clue-giving party game and a logic puzzle, Codenames has players using single words, Password-style, to guide their partners to one or more other words on a grid. A conservative hinting strategy minimizes the potential for catastrophe but is also unlikely to lead to victory. Instead, teams need to take chances—and the game rewards close relationships, as players rely on what they know about each other to deliver exactly the right prompt. “Lonely agony balanced with raucous collaboration”: Read Ruth Graham’s ode to Codenames. There are few games quite like Colt Express, a train-robbing adventure that combines multiple modes of play. Players move bandits around two levels of a 3D train board, picking up loot and shooting at each other, while avoiding a lawman—all prompted by action cards that the competitors place one at a time into a deck. Sometimes everyone can see the cards and can map out an appropriate response, and sometimes the moves are secret, and outlaws inadvertently throw away their shots. Collecting the most money matters less than the thrill of watching a heist play out, one crazy card at a time—like a Mad Libs version of Butch Cassidy and the Sundance Kid. A perennially popular amalgam of a card game and a board game—with origins dating back to the 1600s—Cribbage anticipated the tough “choose your best cards and pass along the rest” demands of many modern games. Once the players have decided which of their cards to keep and which to kick into the “crib,” the scoring rounds rely heavily on their ability to recognize the many combinations of cards than can earn points. from simple pairs to long runs to numbers that add up to 15. Frankly, the board’s unnecessary, because scores could just as easily be tallied on a piece of paper. But often those big old wooden Cribbage tracks become family heirlooms, passed down to the next generation of card players who enjoy an easeful time spent with a loved one counting points and moving pegs. The aptly named “cooperative shouting game” Spaceteam requires players to download a free app, which then connects them in a frenzied race against time, working together to repair a disintegrating rocket ship by trading tools from their supply. (There’s also a tabletop version.) Complicated conditions and quirky twists make it difficult to overcome the impossibly short, constantly ticking timer. Between the barked requests and weird commands (“Set Luminous Foot to Full Power!”), this game combines some of the frenetic fun of the old card game Pit with the silliness of a party game. Not only does Ticket to Ride have one of the cleanest, easiest-to-explain mechanics of the popular modern strategy games, but its basic “build a railroad across the country” concept has been neatly adapted into more than a dozen different maps, each with their own small, challenging variations. The best thing about Ticket to Ride is that while the players are competing with each other—and sometimes getting in each other’s way, claiming exclusive territory first—for the most part everyone’s on their own, trying to complete all the connections they’ve been assigned, before someone triggers the endgame. It’s unusually relaxing, for at least the first half of Ticket to Ride, to make long-range plans and move them closer to completion, one short segment at a time. But then your kids steal your routes, the number of trains start to dwindle, and suddenly making it to Helena becomes a matter of life or death. “Even the losers will want to play again”: Read Noel Murray’s ode to Ticket to Ride. Imagine a version of Trivial Pursuit where it doesn’t matter if you don’t know the answers, because you’re not expected to. In Wits & Wagers, every answer’s a number that—more often than not—nobody at the table is likely to have floating around in their heads. (Example: “How many episodes of Mister Rogers’ Neighborhood were produced?”) Everyone simultaneously makes hurried guesses, then places bets on which answer they think is closest to correct. Beyond learning some fun facts (there were 895 Mister Rogers episodes, just FYI), the rush to write something on the game’s miniature whiteboard means that some poor family member will never live down the time he guessed that the Hollywood sign is 400 feet tall. Give credit to the ’60s game show Password for popularizing a whole genre of party games in which players try to get teammates to guess a word by rattling off other words—like Charades, with speech instead of gestures. Catch Phrase started out as a board game, then was reimagined as a handheld electronic toy, with beeping and buzzes to make the time limit for every round more stressful, as the competing clue-givers hand the device back and forth. The current version is cheap enough to be a staple of department store and grocery store toy aisles (sometimes in multiple editions) but is way more fun than its price tag would suggest, because of the way it combines Password’s basic method of play with a rousing game of Hot Potato. Imagine you’re an explorer, cutting your way through a jungle filled with treasures, trying to reach one of four temples before any of your rivals. That’s the premise of Karuba, which has one of the most ingenious mechanics of any tile-laying game. Each player controls four little adventurers, and each has an individual board to fill with pathway tiles, using the same pieces as their opponents, delivered to everyone in the same order. Nobody has any kind of lucky edge over anyone else, beyond their innate abilities to spot geometric patterns and to plan routes. Just about everyone who’s ever played Pictionary has heard the same complaint from someone at their party: “But guys, I can’t draw!” And just about everyone has a story about how the person who didn’t want to participate came up with the cleverest or the funniest drawing of the night. What makes Pictionary one of the greatest of all party games is that winning doesn’t demand any polished artistic skill. It’s all about finding the precise, most efficient way to convey a clue to your partners. And the aftermath is just as fun, as exasperated players demand to know just what it was their partners were drawing and guessing. Baby Fishmouth is sweeping the nation! Each game of Betrayal at House on the Hill starts the same way: Everyone’s all together, in the foyer of a haunted house, taking and giving suggestions turn by turn about where their various characters should go next and what they should do. As the team explores—with the help of shuffled decks of cards that essentially “build” the house with each blind draw—the danger intensifies. And then, at some unpredictable moment, everything changes, and one random player gets “possessed,” taking on the form of some beastie that everyone else has to beat. The number of possible combinations of rooms and monsters makes Betrayal a different experience every time, though it’s ultimately always going to be about teamwork and guesswork, as the mortals try to figure out just what kind of evil they’re facing and how to squelch it. Introduced in Germany in 1995, the game officially known as the Settlers of Catan quickly spread around the world, transforming tabletop gaming at the end of the 20th century. The blank-looking pieces and wordless board made of hexagons can seem daunting to novices, but the actual turn-by-turn play isn’t that hard to get the hang of. Roll some dice, collect whatever resources you’re due, and then get down to the real work of Catan: building your own miniature civilization if you have the goods to do so, or begging your opponents to trade you some wool or brick or what-have-you so you can make progress. With its balance of wealth accumulation and property management, and its smartly designed variations (in particular “Cities & Knights,” considered by many to be the gold standard for how to design an expansion pack), Catan has for two decades now captured imaginations—and served as a gateway to the exciting, clever new breed of board games. In each turn of Splendor, players can choose between collecting coins and buying cards that can be used in perpetuity as coins. In either case, this game is ultimately all about constant accumulation: no setbacks, just gain. The goal is to hoard wealth faster than the opposition, to get all the extra jewels and special favors needed to win. Everyone’s equal at the start, but it doesn’t take long for Splendor to become a white-knuckle chase between players trying to become more filthy rich than anyone else at the table. In the second half of the 20th century, game designers declared virtual war, drawing on elements of ancient combat-themed board games like chess while adding cards, dice, charts, and historical context. Risk is the game most responsible for setting the trend, but Axis & Allies is better, because its specific grounding in the details of World War II gets across the difficult choices of a real global military conflict. Sure, the competition still comes down to armies trying to obliterate each other. But the fighting happens on the sea and air as well as the land, and the battle extends to the homefront, where the economy and the supply chain are factors. No longer will war be decided by who can roll a higher number. Pandemic is one of the more complex (and critically acclaimed) of the modern cooperative games, in which players are asked to collect resources and to figure out a way to share them in order to achieve a common goal. In this case, the aim is to prevent the eradication of the human race. Teams have to talk to each other and to think several moves ahead, as they come up with a strategy for moving doctors and medicine around a map of the world, before the little colored cubes representing disease spread any further. Other than the novelty of working together with your family rather than trying to crush them, what makes Pandemic such a success is the scope of the challenge. It’s satisfying to move pieces across a board for a noble reason, not just to pile up cash or to reach a finish line. Family game night needn’t end once the kids start getting old enough to drive and to apply to colleges. Modern designers have created plenty of games sophisticated enough to challenge older children—and to daunt their parents. Village is a more detail-oriented version of games like Catan and Carcassonne, in which players on each turn face a plethora of choices about how to go about their business in a small medieval community. Shop? Sell? Travel? Worship? Get into politics? The gimmick here is that because the game takes place across several generations, players can plan for the future but then have to adjust on the fly as members of their “family” die off. Forget the Game of Life. Village is the perfect game to play with older teens, who are starting to work out what’s really important as they prepare to leave the nest. See Slate’s entire Family Games package.